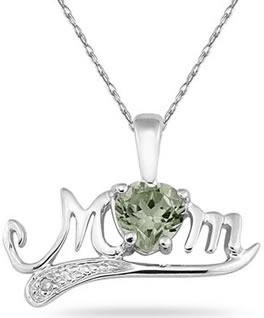 A 5mm heart shaped green amethyst gemstone shines in the center of this MOM Pendant crafted in 10K White Gold. A great gift sure to be appreciated by any mother. An 18 inch rope chain crafted in 10K White Gold is also included. The pendant measures 12mm x 18mm. We guarantee our Green Amethyst and Diamond MOM Necklace, 10K White Gold to be high quality, authentic jewelry, as described above.